Y-12, of course, is known as a nuclear weapons production plant, but it’s also a go-to facility for the government’s efforts to stem the proliferation of weapons on a worldwide basis. For instance, the Oak Ridge plant is playing a role in an international project to develop substitute fuels for some of Europe’s high-performance research reactors and minimize or eliminate their use of weapons-grade uranium. Y-12’s work was referenced in a May 15 report by staff of the Defense Nuclear Facilities Safety Board, which noted that Oak Ridge workers were preparing to repackage quantities of uranium-molybdenum alloy and transfer the powder from storage containers to shipping containers. Asked for more information, Y-12 acknowledged that the work is associated with an agreement reached at the 2012 Nuclear Security Summit in Seoul, South Korea. Belgium, France, South Korea and the United States are collaborating on new high-density fuels that use low-enriched uranium (less than 20 percent U-235) for fuel instead of the highly enriched stuff with weapons potential. The project is still in its early stages. The goal is to have the new fuel qualified for use by 2025 at the BR2 reactor in Belgium and the RHF research reactor in France. Y-12 is involved because of its expertise with uranium in many forms. In support of the international agreement, Y-12 provided an unspecified quantity of low-enriched uranium metal to the Korea Atomic Energy Research Institute (KAERI) in the spring of 2013. The institute alloyed the uranium with about 7 percent molybdenum and transferred the material back to Y-12 for secure storage in February 2014. “As requested, Y-12 will repack and ship the powders to different locations for R&D or full-scale fabrication,” Y-12 spokeswoman Ellen Boatner said. 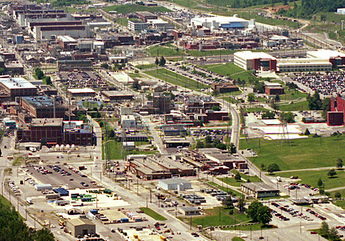 The initial shipment from Y-12 was recently transported to Argonne National Laboratory near Chicago. Argonne will “perform a coating process” with the material and then ship it later this year to France, where it will be fabricated into fuel and irradiated and tested for use in research reactors. All told, Y-12 received 33 cans of the molybdenum-uranium powder from South Korea, and it’s being stored at Building 9720-5, a facility that once housed the plant’s stockpile of bomb-grade uranium (before construction of the Highly Enriched Uranium Materials Facility). So far, three of those cans have been repackaged and prepared for shipment, according to the Y-12 contractor, and only one has actually been sent off-site. Changing containers is apparently a delicate process. The safety board report said the process includes a step to “inert the drum” with argon gas “to reduce the likelihood for an energetic oxidation” of the material. The report said that activity takes place without opening the drum. This entry was posted in CNS, NNSA, nuclear, Y-12 on July 23, 2015 by Frank Munger.